They call him the Iron Man, and he’s earned the name. He’s earned it with his hours-long, intensely physical performances. He’s earned it with the steely attack of his guitar playing, pouring out brilliant, molten solos that build from one verse to the next, until you think he’ll wring the neck off of his Flying V. He’s earned it with the passion and depth of his singing. And he’s earned it offstage too, spending endless hours behind the wheel of his battered van (when he isn’t underneath it making repairs), driving from one end of the U.S. to the other, hauling his band and his trailer full of gear from one club or festival to the next. This is Michael Burks’ third album for Alligator, and it’s been a thrill to watch him grow as an artist—from the juke joint-raised bluesman from tiny Camden, Arkansas playing clubs across the South into a giant of the blues, headlining festivals around the world. In those few years, Michael has honed his own huge guitar sound, bringing a level of rock intensity to the tasteful soulfulness of his playing, and finding his own singing voice, full of emotion and energy. For my money, if anyone in the blues can fill the void left by Freddie King and Luther Allison, it’s Michael Burks. To capture all the fire of Michael’s live performances, we decided to cut this album with his seasoned road band rather than with the Memphis studio aces who supported him on his last two records. Wayne, Popcorn and Don have backed Michael on literally hundreds of gigs, and they know his every move. So we were able to cut these tunes almost completely live in the studio, with Michael lighting a fire under the band just like he does onstage. This album captures Michael “Iron Man” Burks at full force, doing what he does so brilliantly a hundred nights a year—delivering raw, up-to-the minute, electrified and electrifying blues with a master’s touch. Click the LISTEN button to hear "Love Disease" from IRON MAN. Peace ,Love , and BBQ is perhaps the most multi-faceted and deepest album of Marcia's career. From the pure New Orleans fun of "Party Town", "Watermelon Times", and "Right Back In It", to more serious commentary on Katrina and it's aftermath with the probing "Where Do You Go" and the inspirational "Ride It Out", two of her more arresting compositions(the former co-written by Tracy Nelson, who also appears on it). Contributions by Dr. John, Terrance Simien, and Wayne Toups add to the Gulf Coast ambiebce. Plus, Steven Bruton's production is terrific,especially in the way that he frames Marcia's performances of "Miricle In Knoxville" and "Down In The Neighborhood" with a fascinating soundscape. Marcia has described Peace, Love, and BBQ as the album she's proudest of in her long career, and its easy to hear why. Working on the next contest - keep watching for our announcement. Finis Tasby, adds "cover boy" to his resume. 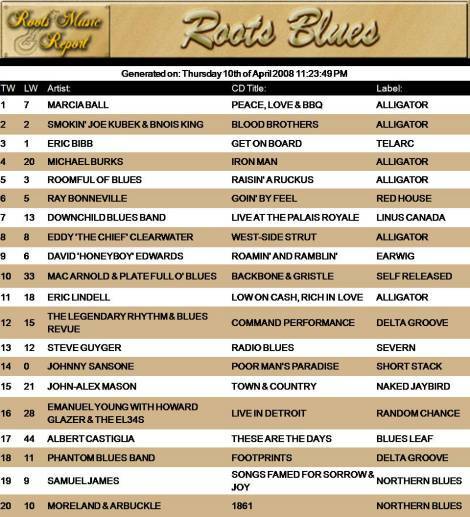 The California-based band the Mannish Boys have quickly become one of the most popular blues bands in the country. The four-year-old band is a sort of blues “supergroup” featuring some of the hottest California blues musicians as well as three venerable frontmen/vocalists, Finis Tasby, Johnny Dyer, and newest member Bobby Jones. The story follows the band in the studio recording their fourth and introduces us to each of the current members of the band. 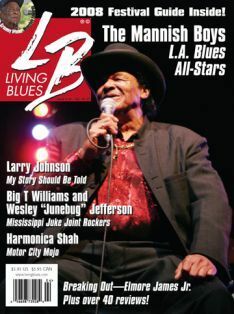 This month Living Blues magazine has honored The Mannish Boys with the cover position. 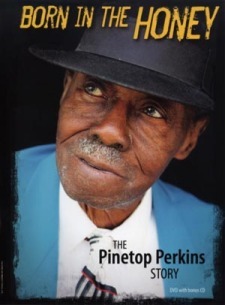 The festival will kick off with a Blues Marker Dedication honoring Pinetop Perkins. Sometimes it takes a death in the “family” to bring people together for change. It has been a year since Portland blues great Paul deLay passed from the effects of late-stage leukemia. And it’s been more than ten years since the figurative “death” of music education in the Portland public school system. So, former members of the Paul deLay band are joining forces to celebrate the life of the Big Man on Harp, by raising money for kids to learn music. Duffy Bishop, Linda Hornbuckle, Lloyd Jones, Terry Robb, Joe McMurrian, Jimi Bott, Fiona Boyes (and other special guests to be announced) are on-tap for a great night of blues in memory of Paul deLay. Players who made up the various incarnations of the Paul deLay Band will host this fundraising event—including David Vest, and D.K. Stewart on keyboards; Peter Dammann on guitar; Dave Kahl, Don Campbell on bass; and Jeff Minnick, Kelly Dunn on drums. This special event will also feature special guests, Teresa James & the Rhythm Tramps based in Los Angeles. Charles Lewis founded the Ethos Music Center in1998, in response to budget cuts that severely limited arts education in Oregon’s largest public school district. It’s name comes from the ancient Greek "Doctrine of Ethos," which held that music can change your thoughts, moods, and actions. Ethos believes every child should have the opportunity to make music. The Ethos Music Center, in Northeast Portland, is now working with area musicians to endow a new scholarship program to honor the late, GREAT Paul deLay. ALL the proceeds from "Remember me..." the Paul deLay Scholarship Project Benefit Concert will go toward this scholarship program at Ethos. 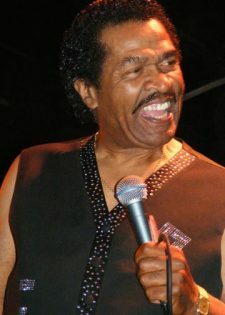 deLay wrote the haunting lament “Remember Me” after the death of his own mother, and the mothers of three band members, within a challenging two-year period. It was released on the Heavy Rotation CD (Evidence Music) in 2001. Now, we remember Paul. Tickets for this ALL AGES EVENT are $20 in advance, $25 at the door (children and students $10 in advance, $15 at the door). 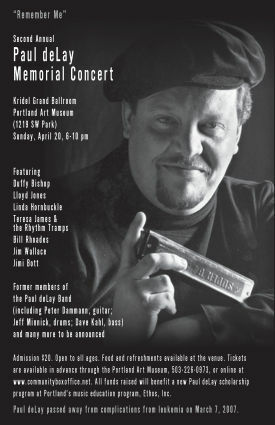 Advance tickets are available through the Portland Art Museum, 503-226-0973, or online at www.communityboxoffice.net. Food and refreshments will be available. JUNO AWARD FOR "BLUES ALBUM OF THE YEAR"
The 2008 Canadian JUNO Awaard for "Blues Album of the Year" was awarded to FATHEAD. 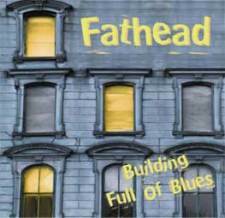 FATHEAD’s 2007 release, BUILDING FULL OF BLUES, is the sixth album in a critically acclaimed catalog that has won the group nominations and awards, including a JUNO Award and several Maple Blues Awards. Marrying blues with elements of soul, R&B, and a little bit of Cajun spice, the band has a distinctive sound. 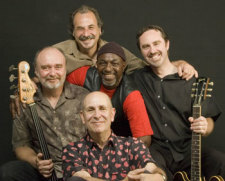 The band consists of leader Al Lerman (harp, sax, vocals), Omar Tunnoch (bass, vocals), John Mays (lead vocals), Darran Poole (guitar) and Bucky Berger (drums). To celebrate its 125th anniversary, The Gretsch Company, one of the world’s most well-known drum and guitar manufacturers, is kicking off the Next Gretsch Greats Unsigned Artist Competition, an online competition to identify the world’s hottest unsigned bands. The competition entry period will begin May 1 and end May 31, 2008. To enter the competition, artists simply visit www.gretsch125th.com and submit an mp3 file of the original song that could help make them famous. Every artist who enters will receive a free commemorative Gretsch 125th Anniversary poster, while the top three prizes include the opportunity to perform at Gretsch’s 125th Anniversary Concert in New York City and enough Gretsch gear to take an up-and-coming band out of the garage and into the limelight. 2nd Prize winner wins $1,250 in Gretsch-product gift certificates to help them take their sound to the next level. Ten finalists will be selected by popular online voting at www.gretsch125th.com in June and July. Then, the finalists will be judged by an expert panel who will select the grand, first and second prize winners. More information about The Gretsch Company’s 125th Anniversary celebrations can be found at www.gretsch125th.com and www.myspace.com/gretsch125th. Jessie Mae Hemphill: Left out of the credits. 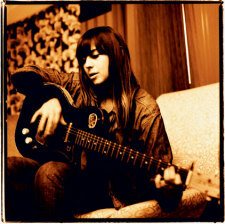 Despite near-ubiquitous praise for Chan Marshall's (aka: Cat Power) JUKEBOX covers from the songwriters and performers interviewed for this story, there is one artist whose friends believe Marshall cheated her. In the album's liner notes, "Lord, Help the Poor and Needy" is credited as "Traditional, by Jessie Mae Hemphill, arranged by Chan Marshall, Public Domain." Olga Wilhelmine Mathus, a San Francisco–based blues musician and founder of the Jessie Mae Hemphill Foundation — a nonprofit dedicated to the preservation of the northern Mississippi hill country blues tradition — says the song isn't in the public domain and that Hemphill owns the copyright. Mathus believes Marshall owes royalties to the late singer's estate. "The money from that song should go to Jessie's estate and be divided up among her relatives, who, much like Jessie, are poor, elderly black people, many of whom are living off welfare," Mathus said. "This isn't anything new. It's unfortunate that most of the originators of blues music died in poverty because of situations similar to this." Hemphill, a W.C. Handy Award–winning electric guitarist, songwriter, and singer, was born in Senatobia, Mississippi, in 1923. 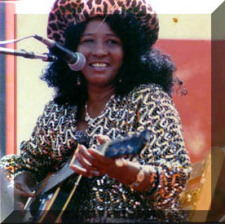 She spent decades playing on Beale Street in Memphis before releasing two albums in the 1980s and '90s. In 1993, she suffered a stroke that paralyzed her left side, leaving her unable to play guitar for the remaining 13 years of her life. Some might dismiss Mathus' fervor for Hemphill's cause as sadness over the loss of a close friend and musical mentor, but it takes only a couple minutes of Internet searching to discover that "Lord Help the Poor and Needy" is indeed copyrighted to Jessie Mae Hemphill with Broadcast Music, Inc. and the United States Copyright Office. When asked about the disputed credit on April 1, Matador Records cofounder Chris Lombardi seemed ready for the question. "We made a mistake and credited it incorrectly on the album," he said. "It's actually a Jessie Mae Hemphill song. I think we thought it was a traditional song and had not yet been registered, but her representatives contacted us recently and we're setting up the mechanical royalties now." Even as Matador works to resolve the missing credit, the dispute raises an interesting question: Is the simple payment of publishing royalties enough recompense for copyright infringement? In 1985, blues legend Willie Dixon successfully sued and won credit and royalties from Led Zeppelin after alleging that their 1969 hit "Whole Lotta Love" was appropriated, without credit, from his "You Gotta Be Loved." So what is ample restitution for infringing on an artist's copyrighted work? Mathus believes money is a good start, but hopes the attention Cat Power's music receives could ignite a spark of interest in Hemphill and her fellow musicians. 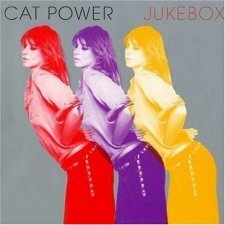 "I think it's good that someone of Cat Power's visibility covers a song like this, as it makes it more accessible for the more mainstream audience," she says. "A lot of folks were turned on to R.L. Burnside after Jon Spencer came out with a record on him, so perhaps this will turn more people on to Jessie's music, the music of the north Mississippi hill country, and the life and struggles of many of these artists." "One of the best CDs I've heard in a long time!" says Tommy Castro. 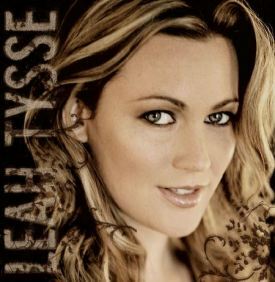 Leah Tysse's debut album is a fresh take on blues and R&B with plenty of horns and wailing vocals reminiscent of her heros Big Mama Thornton, Lydia Pence, Koko Taylor and Aretha Franklin. Leah writes and produces her material impressively and belts those songs out like she was born to do so. From her smoking horn-infused opening track 'Real Good Fire', to her sensual ballads and traditional blues you'll always be wondering what's coming next and you won't be disappointed. When you watch her perform, listen to her songs and, especially, hear that voice, you'll be convinced that Leah Tysse's arrival brings the next big thing to Blues, R&B and Soul. Breaking news for new album! 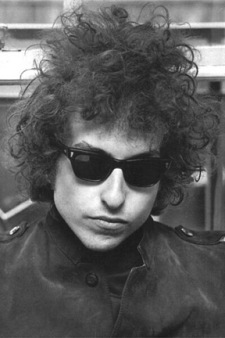 Click the LISTEN button to hear "You Don't Scare Me"
Bob Dylan s set to become the first rocker to land a prestigious Pulitzer Prize for his songwriting prowess. The singer received an honorary Pulitzer on Monday for his "profound impact on popular music and American culture." It marks the first time Pulitzer judges have honored a rock star. Past musical accolades have been given to classical music and jazz artists only. We will be announcing our winners for solo/Duo, as well as full band next week. Keep an eye out for these Blues Artist's on the Rise. Click on button to hear last years winners, The Mighty Lester perform 'Gonna Ball Tonight"
NEWS FROM LOUISIANA, QUEBEC, WASHINGTON D.C. Standing near framed photos of Raful Neal, Slim Harpo and Tabby Thomas, Mayor Kip Holden announced that after a 13-year hiatus, the Baton Rouge Blues Festival is making a comeback. During a news conference held late last month, Holden announced that the festival will be held April 26 in Repentance Park near the Old State Capitol. Among the artists scheduled to perform are Marcia Ball, Tab Benoit, Kenny Neal and Phil Guy. 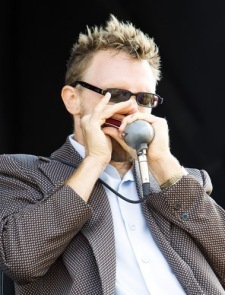 "The festival was really missed and it was kind of ridiculous we haven't had it in a long time," said Baton Rouge blues musician Luther Kent, who attended the March 27 news conference in front of the Louisiana State Museum and will be among the featured artists at this year's event. Johnny Palazzotto, president of the Baton Rouge Blues Foundation, said the festival was canceled more than 10 years ago partly because there was a segment of the community that didn't think the festival was family entertainment. "For some reason, there was a lack of enthusiasm about it back then," Palazzotto said. "But these musicians from Baton Rouge travel the world promoting Baton Rouge and blues music, so it's time for the festival to come back." Baton Rouge blues guitarist and singer Larry Garner closed out the news conference with a rendition of his 1994 song, "Go to Baton Rouge." "Don't go to New Orleans if you're searching for the blues," Garner's lyrics advised. "You gotta go to Baton Rouge." For its 15th birthday, the awesome Tremblant International Blues Festival (Quebec, Candada) will include several big name stars – such as Johnny Winter – many artists who were featured in recent editions of the event, plus several concept shows bringing together on stage several well-known artists. This website will be updated frequently between now and the event, so visit often! Announcing Texas blues legend Johnny Winter, Ana Popovic & slide master Sonny Landreth! The festival runs from July 4th - July 13th. Click here for more info. The 5th Annual Congressional Blues Festival will take place at the John F. Kennedy Center for the Performing Arts in Washington, DC on April 23rd. Come and see Music Maker artists Beverly Watkins, Mudcat, Ron Hunter, Macavine Hayes, and Captain Luke along with other great artists Elvin Bishop, The Robert Cray Band, and Sara Lee Guthrie and Johnny Irion. The Wichita Blues Society's (Kansas) Crawl Spring Blues Crawl is Sunday, April 27th, from 6pm-12 am in Old Town. A long time Wichita tradition features local blues bands from 6-9 pm in many clubs and restaurants in Old Town. The after party at Americas' Pub is from 9pm-12am features this year, Jimmie Lewin & the Kingtones. The Blues Crawl line up for 6-9 pm features: America's Pub...Berry Harris & the 9th Street Blues Band, Heroes...The Nightwatchmen, Larkspur...Rachelle Coba, The Brickyard...The Toltecs, O'Sullivan's...Made From Scratch, Loft 150...Little Smoke, Torre's Pizzeria...Bloodline Posse with Rudy Love, Club Indigo...Clif Major's Rockin' Blues, and Morts...The Sharon Rush Blues Band. The cost is $5.00. You can purchase a wrist band at any location and that gets you in to all venues. This is a fundraiser for the Wichita Blues Society. $20 Includes Membership, Food, and Awesome Blues!!! Ronnie Baker along with other popular entertainers will perform at a benefit/birthday party for Sue Luley of Earth Awareness (the Blues Society of Brevard Cty, Florida), whose friends have organized her 50th birthday party in conjunction with a benefit concert to help her with medical expenses and to raise awareness for Hepatitis C. Hepatitis C is a silent killer that attacks the liver, most people don’t even realize they have it because symptoms do not show up for years, most people are unaware that they must request the HEP C blood test from there doctor. The National Institutes of Health (NIH) estimates that some four million Americans are infected with HCV. An estimated 8,000–10,000 Americans die annually of complications related to HCV. This figure is expected to triple in the next 10–20 years. HCV is the leading reason for liver transplants in the U.S. The party takes place at the Cocoa Beach County Club Pavilion, 5000 Tom Warriner Blvd, Cocoa Beach, FL on April 19th from noon till 10:30 pm. The concert is free, donation jars are placed throughout the event. There will be food and drinks for sale, hamburgers and hot dogs from grill master Billy Rigg, an old fashioned bake sale, silent auction featuring art by Gary Propper, great raffles and lots of outdoor fun. There will be a visit by the Florida Blood Center Mobile Donation Unit (Bus) on site from noon until 5pm Saturday, April 19th. The River City Blues Society (ILLINOIS) will be holding a membership drive Saturday, April 12 at Po Boys 3207 N University in Peoria, IL with music by South Side Cindy & The Slip-Tones at 8:30 pm. This is the night to join the River City Blues Society. Membership is normally $15 for individual membership or $20 for a family membership.While this is already a great bargain price, if you come out on this night and join you will get one FREE admittance to Po Boys (Normally $4 cover charge) AND South Side Cindy and tha gang will give NEW members a choice of one Slip-Tones CD or T-shirt. Talk about a discounted membership, WOW! Also current members will get in for half price and those renewing an existing membership will get one FREE admission to this great show. Fort Mill, South Carolina, U.S.